The Rendezvous Room and Event Center was designed so you could relax and enjoy your event with your friends in a lodge look surroundings. let us take care of everything for you. With its vaulted ceilings and new sound system it is surely to impress your friends. 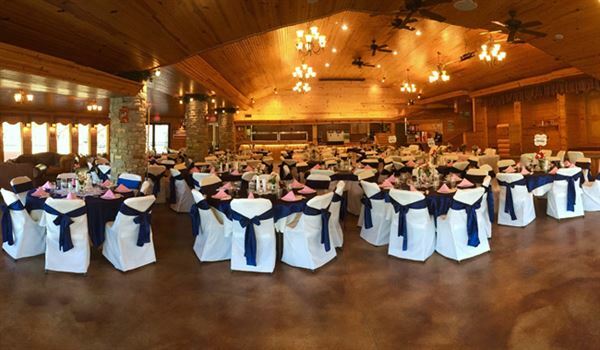 With its large glass windows overlooking the river and its special lighting you will experience the best wedding, reception, shower,birthday party, banquet, reunions, anniversary party or any type of event you desire. We have over 30 years in catering experiences for your convenience. this room will hold up to 180 guests and has its own bar and stage for your entertainment.Oh lets not forget the large rock fire place and rock pillars. We also have cabins available for your guests that want to spend the night. I'm sure you'll love The Rendezvous Room. So please give us a chance to show you the room and what all we have to offer.